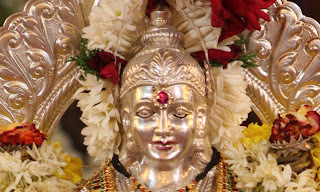 Varalakshmi Puja is performed by married women for the well-being of husband and the other family members. It is believed that worshipping Goddess Vara-Lakshmi on this day is equivalent to worshipping Ashta-Lakshmi - the eight Goddesses of Wealth (Sri), Earth (Bhu), Learning (Saraswati), Love (Priti), Fame (Kirti), Peace (Shanti), Pleasure (Tushti) and Strength (Pushti). Varalakshmi Vratam is one of the most appropriate days to propitiate and to seek blessing of the Goddess Lakshmi.